Jimmy “Savage” Hardy wants to make a name for himself as a gang leader in Limerick City, Ireland, but he’ll have to overcome waves of opposition to get there. He’s made enemies of rival gangs, the cops, his best friend, and even his mother, and they all want to take him out before he becomes an even bigger problem. 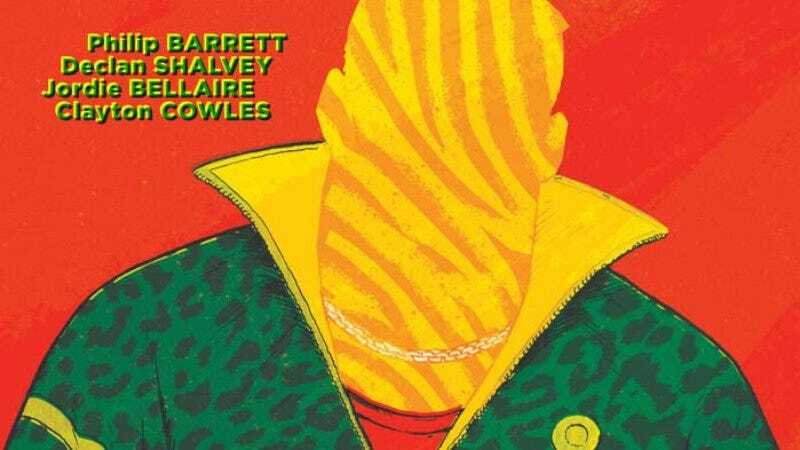 Jimmy’s story is at the center of Savage Town, the new Image Comics graphic novel coming in September from writer Declan Shalvey, artist Philip Barrett, colorist Jordie Bellaire, and letterer Clayton Cowles. Shalvey has built a reputation as one of the strongest visual storytellers in comics with his artwork on books like Moon Knight and Injection (not to mention his jaw-dropping The Punisher covers), and over the last year he’s shown that his storytelling skills transfer over to writing. The Nick Fury story he wrote and drew for Civil War II: Choosing Sides was one of the highlights of that event, but Savage Town is his first time writing for a different artist: fellow Irishman Philip Barrett. These exclusive preview pages from Savage Town showcase Barrett’s deep understanding of the look and feel of Limerick City, and he’s put a lot of thought into the setting and its inhabitants. You don’t need text to know what is happening in that first splash page showing a belligerent man yelling at unassuming patrons of a local pub, and that clarity carries through each of these pages as the story checks in with different characters. There’s a lot of restraint shown in the depiction of violence, and rather than exaggerating the action, the art keeps it grounded to highlight the brutality of this sudden ambush. Colorist Jordie Bellaire has worked with Shalvey for years, and her coloring does excellent work setting the tone of each scene and reinforcing the rhythm of Barrett’s layouts. Her flat rendering ensures that all the detail in Barrett’s linework shines through, and there’s an especially impressive use of yellow in the final two pages to intensify the action beats. Readers can learn more about the mean streets of Savage Town when the graphic novel goes on sale September 6, but in the meanwhile, here’s a first look at unlettered pages.